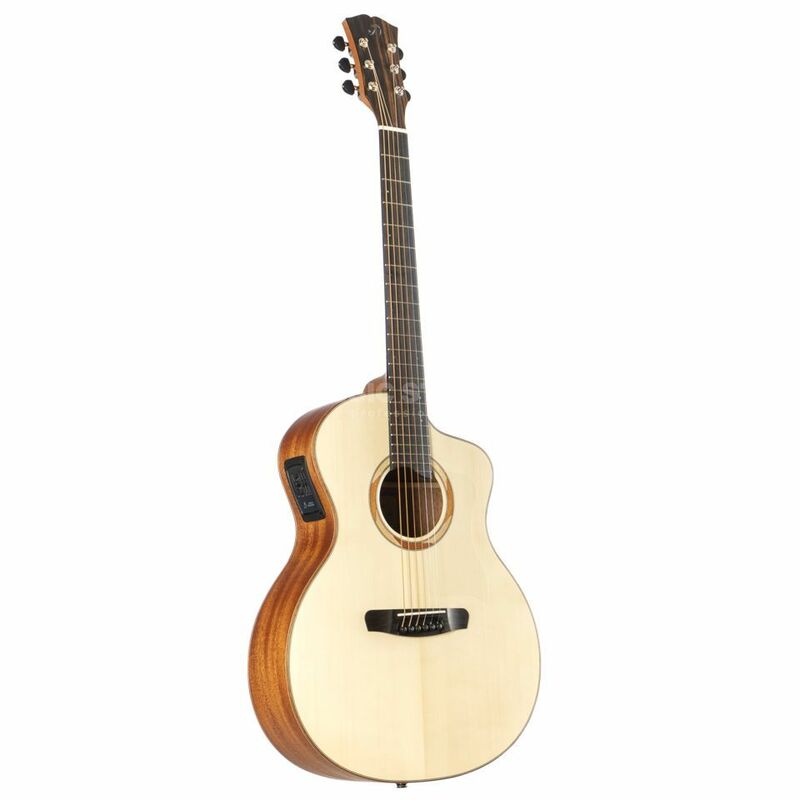 The Dowina Sauvignon GACE Grand Auditorium Western Guitar is the ideal companion for stage and studio. With a top made of solid Dolomite spruce, a solid Sapele body in Grand Auditorium design and a Stage Pro Element pickup system of the pickup guru L.R. Baggs, the Sauvignon GACE can convince both acoustically and electrically amplified. Last but not least, the wide cutaway makes it easy to play in the high positions of the fingerboard. A top made of solid Dolomite spruce and solid sapele in the back and sides form the soundboard of the Dowina Sauvignon GACE. The Dowina team opted for spruce wood from the Dolomites for the tonewood ceiling as the sounding element. The wood felled in high regions of the Southern Alps represents the classic overtone-rich sound characteristics of spruce and impresses with its narrow and even grain. Finally, popular Sapele from the mahogany wood family is used in the back and sides, which complements the sound image with vocal mids and a healthy bass foundation. Last but not least, the voluminous Grand Auditorium design contributes to the dynamic appeal of the Dowina Sauvignon GACE. The control panel of the L.R. Baggs Stage Pro Element in the frame of the Sauvignon GACE. For working with effect devices, amplifiers or recording devices the L.R. Baggs Stage Pro Element pickup system is used. The piezo pickup located under the bridge insert picks up the sound from strings and tonewood top and transmits the dynamic sound character to the integrated preamp, which prepares the signal for further use and adjusts it to the appropriate signal strength. Further sound adjustments can finally be made via the 3-band equalizer with selectable notch frequency, while a switch for phase reversal remedies unwanted feedback.